Apart from prowling the virtual corridors of cyberspace or interacting with Apple’s iLife programs, most of your face time on a Mac will find you engaged with some full-blown (and often pricey) software application — even if you take advantage of a relatively narrow set of features. The wordsmiths among you couldn’t subsist without Microsoft Word or some other industrial-strength word processor. You graphic artists live and breathe Adobe Photoshop. But personal computing isn’t always about doctoring photos or penning the great American novel. Sometimes all you want is a quick snippet of information. Maybe you need to check the temperature or a stock quote. Or, you want to look up a phone number or figure out whether your plane is on time. Perhaps you want to locate an Italian restaurant for dinner or calculate a mortgage payment. That’s what a gaggle of mini-applications known as widgets are all about. Indeed, these lightweight programs generally serve a useful and singular purpose — from letting you track an overnight package to finding out whether your favorite team covered the spread. Frankly, you can perform many of these tasks through the Web or other programs on your desktop. But few do it with the convenience and flair of widgets. Fronted by large colorful icons, widgets come at you en masse when you summon Dashboard. This translucent screen lays on top of your desktop. Nothing underneath is disturbed. You either click the Dashboard icon in the dock or press F12 to open the Dashboard. Pressing F12 again closes Dashboard. You can also exit by clicking anywhere other than on a widget. To get you started, Apple supplies a collection of basic widgets (calculator, clock, calendar, and weather). The more interesting widgets are available online. You can embark on a widget hunt at Apple.com. When you call up Dashboard, only the widgets you previously used appear on the screen, right where you left them. The rest are cozying up to the widgets bar, which you can open by clicking the + button. If you want to enlist one of the widgets, just drag it onto the Dashboard area. It will dazzle you with a ripple effect as it makes its grand entrance. Click the X button (labeled in Figure 1) to close the widgets bar. 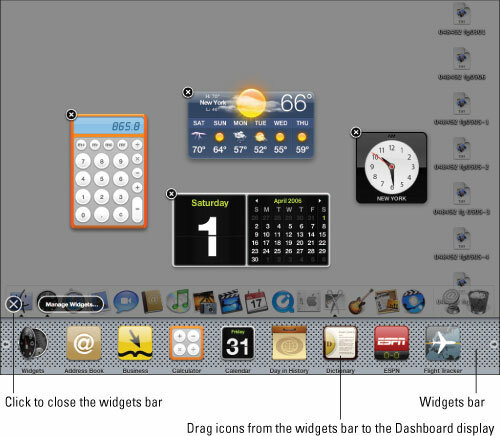 Figure 1: Widget-mania at the widgets bar. The great majority of downloadable widgets are gratis. A few are available as shareware, meaning that you can try them out before paying. Whether you actually fork over the loot is up to your conscience, but unless you think the program is worthless, its creator should be rewarded for his or her efforts. Some widgets are extensions to other programs on your computer, such as the ones that display data from iCal or your Address Book, or bring up blank Stickies. But most widgets grab feeds off the Internet, so you need an online connection. Widgets in this category might tell you what’s on the tube tonight or deliver a surfing report. If you hold down Shift while you press F12, the widgets will open or close in super-slow motion. If you hover over an open widget and press Command+R, the wizard twists like a tornado and refreshes itself. Any “live” information is updated. To rearrange widgets on the Dashboard area, just drag them around. You can display more than one of the same widget, which is useful, say, if you want to check out the weather or time in several locations. Just drag the widget out again from its hiding place in the widgets bar.